Mendota Dakota and the Rebirth of a Community, video documentary. This documentary film follows the story of the Mendota Dakota, a Native American tribe from Mendota, Minnesota, from pre-Minnesota to the present era. It includes interviews with Jim Anderson, Sharon Lennartson, Jim Albrecht and Curt LeClaire of the Mendota Dakota tribe. It also features a short speech from Arvol Looking Horse, the 19th generation Keeper of the Sacred White Buffalo Calf Pipe. This film was created by Brian Gilbert. A women from the Yankon Sioux Tribe sent this. brother, but to fight my greatest enemy – myself! Our mother would have been 100 today. She was born on March 21 1911. Here is a picture of her brothers and sister. Selisha is on the left side. We love and miss mom. Love Mickey, Beverly, Sharon, Linda and the rest of your family. My uncle Russ is in his 80’s, he has the white shirt on. My auntie Margaret is in her 90’s. We love you both so much! This story is about us becoming the Mendota Mdewakanton Dakota Community. It is also the home of our ancestors. Our ancestors never left Mendota, this is our roots. Click on the picture once to make it larger, twice to make it even larger. Thank you Bruce for writing this story. March 15th, 2009 by Bruce White. Someday the fact of there being two classes of Dakota people in Minnesota, the very, very rich and all the others, may finally be addressed. But, even if the income inequality among Dakota is not remedied, the conclusions drawn by many non-Indians about who is Dakota and who is not based on wealth and other arbitrary factors must be discussed. Those who draw such conclusions should at least acknowledge the process through which the inequalities came about and respect those who were not in the right place at the right time. Among those who exemplify the inequalities among the Minnesota Dakota are the members of the Mendota Mdewakanton Dakota Community. The Mendota Dakota are a non-federally recognized community consisting of a number of families of Dakota descent, mostly from the town of Mendota, which is a small town in the midst of the metropolis, across the mouth of the Minnesota River from Fort Snelling. Daughters, sons, and later descendants of Dupuis and Renville married into other families, often French or Dakota or even Ojibwe mixed blood and most continued to live at Mendota into the 20th century. They also had relatives on the Santee Reservation in Nebraska and there were reports of visiting back and forth. And when Dakota families moved back to Minnesota over the decades, the Mendota Dakota were there to greet them and offer them a place to stay. My introduction to the Mendota Dakota came about during the struggle over Highway 55, when the Minnesota Department of Transportation and other agencies pushed through the construction of the highway with very little environmental or historical or cultural review. The Mendota Dakota were among the groups who put their bodies on the line to try to stop or mitigate the construction. Some of the story of what happened, along with some Mendota history is found in Mary Losure’s book Our Way or the Highway. The protests of 1998 to 2000 seemed to have very little effect on the route of the highway but various groups including the Mendota Dakota were able to get through the state capitol in St. Paul a law protecting Coldwater Spring. The leader of the community at that time was Bob Brown, a descendant of Angelique Renville through the extended Leclaire family. Like many he was tied to Mendota but had lived in other parts of the Twin Cities because that’s where the jobs were. Bob’s grandfather Albert Leclaire had grown up in Mendota. His grandmother Lillian Felix—one of whose nieces married Amos Crooks at Prior Lake—had attended Carlisle Indian School. In the 1920s and 1930s Albert Leclaire and family members, including Bob’s uncle Russell Leclaire, lived and farmed at Prior Lake on a land assignment from the Department of Interior—on the 1886 Mdewakanton Sioux lands that would later become the Shakopee Mdewakanton Sioux Community. His land certificate certified that he was a member of the May 20, 1886 Mdewakantons. Albert Leclaire died as a result of injuries sustained in an automobile accident on the reservation in 1942. Refused treatment at local Shakopeee hospital he was transported all the way to the agency in Pipestone where he died after a few weeks. 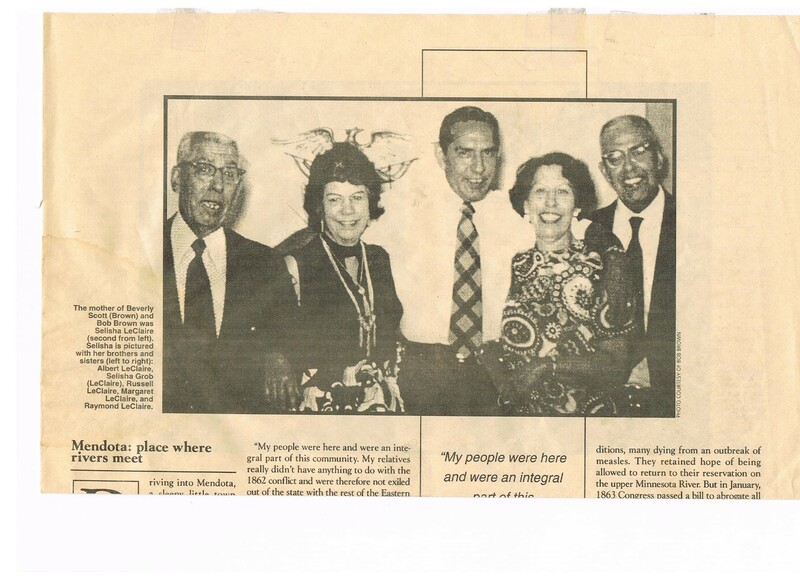 The five children of Albert and Lillian Leclaire, including Raymond, Selisha (the mother of Bob Brown), Russell (in the center), Margaret, and Albert. Russell Leclaire recalled that over the years after his father’s death he was on good terms with the children of Amos Crooks who were first cousins once removed. Russell used to go back on visits to Prior Lake. At one point Norman Crooks said to him that he ought to move back because they were going to start a bingo hall and things might get better on the reservation. Russell later said that he did not want to give up the life he had built in the cities and that there were too many bad memories of living there as a child. It should also be mentioned that one reason Russell Leclaire and his father had never became members of the Prior Lake community when they lived there in the 1930s was that the federal government did not allow the community to be organized under the 1934 Indian Reorganization Act until 1969. Later on when the Prior Lake Sioux, now calling themselves the Shakopee Mdewakanton Sioux Community, began to have more success, Bob Brown and some of the other people at Mendota sought membership in the community but, like many they were turned away. In effect membership there was like a game of musical chairs. If you were sitting there when the music stopped playing you were a member. Otherwise, forget it. There are many other odd anomalies resulting from the delay in the organization at Prior Lake. For example the Amos Crooks family, including Norman Crooks, were living in Long Beach, California for a good part of the 1930s and had the Prior Lake community been organized then, they would not have been members of it. The Mendota families tried again and again at Shakopee. Finally someone in the offices there said sarcastically, “Why don’t you form your own community?” This is what they did. Of course the Mendota Dakota were already a close-knit community, people who stayed together, went to church together, celebrated together, people who might go away from Mendota to look for jobs and opportunity, but who always came back. So forming their own community simply meant creating a formal organization, a 501 (c) (3). At this point the Mendota Dakota began to look into getting federal recognition, without knowing exactly how difficult this would be. They began doing extensive genealogy and historical research, amassing a great deal of supporting information. But getting federal recognition for an Indian community is an impossibly difficult and cumbersome process that a few experts in the field say requires at least a million dollars to start with. This is to pay for the research, the lawyers, the genealogists, to gather and present information about a community to meet a set of arbitrary standards that a few recognized groups would be unable to meet today if they had to prove their legitimacy. The late 1990s were a frustrating time for the Mendota Dakota, because the more they worked the farther away the goal seemed to get. But then Bob Brown and the other Mendota Dakota decided that they would focus on being the people that they wanted the federal government to recognize them as being: a Dakota community that cared about the cultural heritage of being Dakota. Bob, his sisters Bev and Linda, his dynamic wife Linda, and other many other members of the Mendota Dakota began to take responsibility for the cultural heritage of Bdote, the sacred area around the mouth of the Minnesota River. It was an important time to get active because of all the development pressures on the Bdote area that few other groups seemed to be fighting. The Highway 55 struggle and the protection of Coldwater Spring were part of it. But even though the highway was built, there were other jobs to do. When word got out that a development was proposed for Pilot Knob, known to the Dakota as Oheyawahi, the Mendota Dakota drew together a coalition of people, supporters or preservation, environmentalists, and Highway 55 opponents, and historians and anthropologists like Alan Woolworth and me. They set out to educate people, engaging in the political process as various proposals made their way through the Mendota Heights City Council. In the end, through the help of public and private funding, the city was able to obtain title to the development land, preserving it as public open space. This was a long arduous process, with many people contributing on the way. The Mendota Dakota did not do it all, but they inspired many others to make it happen. A year ago, I heard Mayor of Mendota Heights John Huber say that his own conviction that Pilot Knob should be saved from development was inspired by a speech given by Michael Scott, who succeeded his uncle Bob Brown as chairman of the community after Bob’s death in 2003. At a public meeting in St. Peter’s Catholic Church in Mendota, Michael spoke eloquently about the necessity of protecting Dakota burial places. Over the years Michael’s cousin Jim Anderson has often worked to help coalesce the force necessary to continue the Mendota Dakota legacy of looking after Bdote. Curt LeClaire, who is now the chair, and Bob’s sister Sharon Lennartson, and many others carry on to do fulfill the community’s role at Bdote. Over the years the Mendota Dakota have quarreled internally. They have had missteps along the way. They have been ignored and sometimes ostracized by government agencies in shameful ways, including by the Minnesota Historical Society. But they have kept on going. Several years ago I went to a meeting at the office of the Mendota Dakota on how to mobilize and educate people on the issue of the Treaty of 1805 and the rights the Dakota signers reserved in it for their people. I can imagine few other places on Indian reservations or in universities where I could have gone to discuss the treaty in as much detail as we did that day in Mendota. It was a beautiful thing to say, especially because that is the way the Mendota Dakota have been as long as I’ve known them. The greatest lesson I have learned from the Mendota Dakota is that one should never wait for approval or validation from others before setting out to do something important. Instead, be who you are or want to be, regardless of what others say about you.